This image shows some unusual features on the surface of Jupiter's moon, Ganymede. 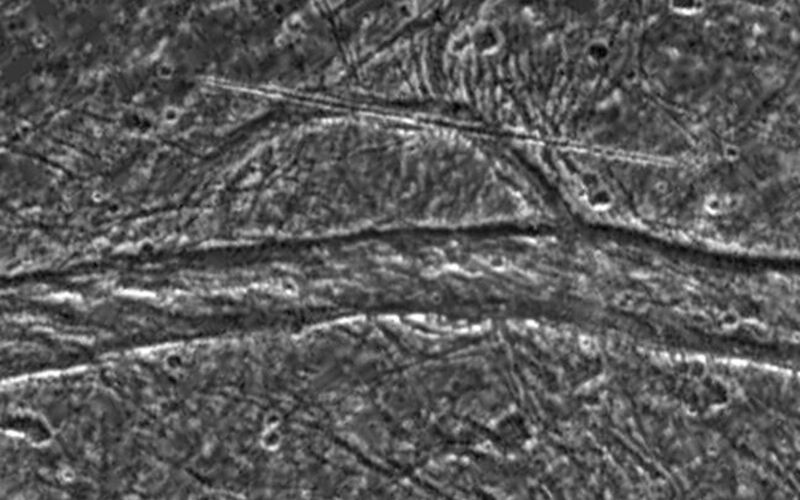 NASA's Galileo spacecraft imaged this region as it passed Ganymede during its second orbit through the Jovian system. The region is located at 31 degrees latitude, 186 degrees longitude in the north of Marius Regio, a region of ancient dark terrain, and is near the border of a large swathe of younger, heavily tectonised bright terrain known as Nippur Sulcus. 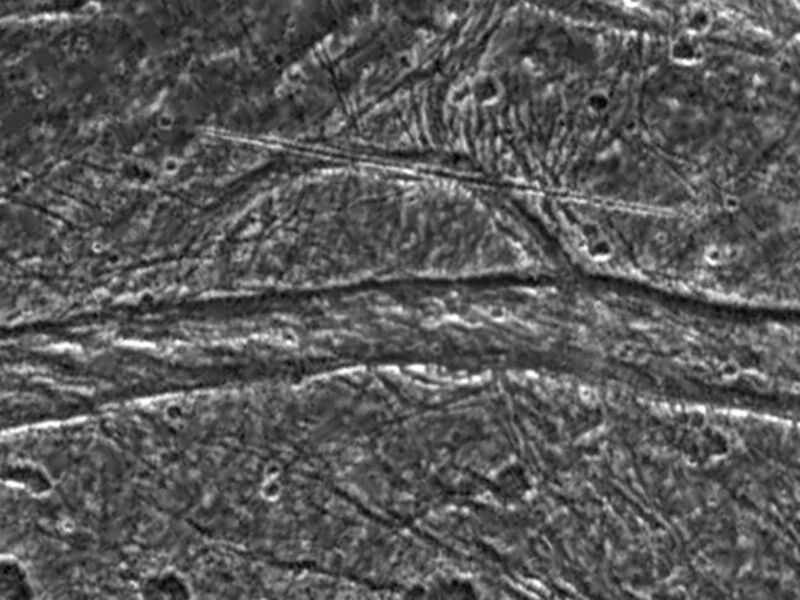 Situated in the transitional region between these two terrain types, the area shown here contains many complex tectonic structures, and small fractures can be seen crisscrossing the image. North is to the top-left of the picture, and the sun illuminates the surface from the southeast. This image is centered on an unusual semicircular structure about 33 kilometers (20 miles) across. 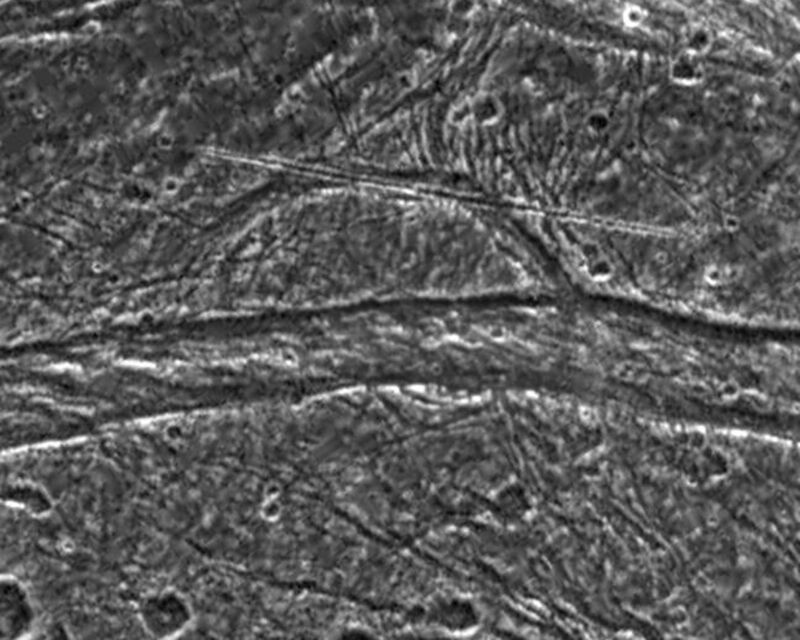 A 38 kilometer (24 miles) long, remarkably linear feature cuts across its northern extent, and a wide east-west fault system marks its southern boundary. The origin of these features is the subject of much debate among scientists analyzing the data. Was the arcuate structure part of a larger feature? Is the straight lineament the result of internal or external processes? Scientists continue to study this data in order to understand the surface processes occurring on this complex satellite. The image covers an area approximately 80 kilometers (50 miles) by 52 kilometers (32 miles) across. 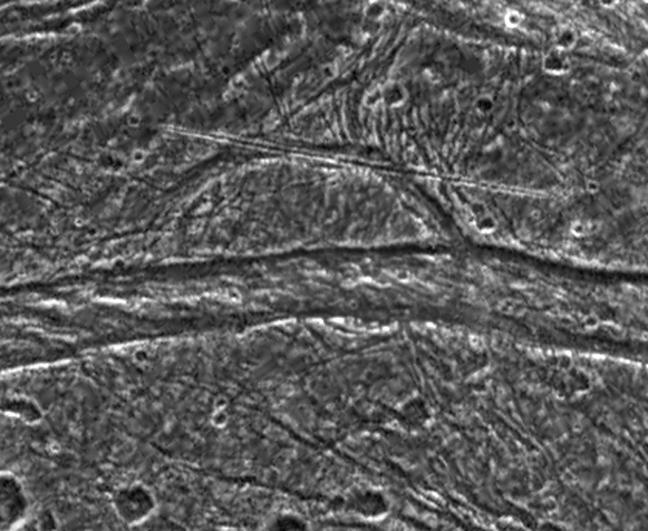 The resolution is 189 meters (630 feet) per picture element. The images were taken on September 6, 1996 at a range of 9,971 kilometers (6,232 miles) by the solid state imaging (CCD) system on NASA's Galileo spacecraft.